This past week I went on one of the most unique travel adventures I’ve been on yet. 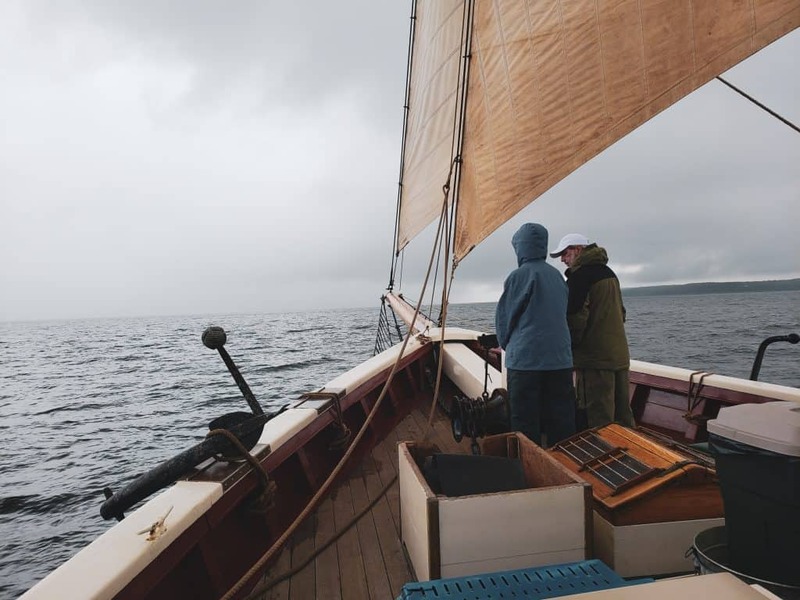 I experienced a Maine windjammer cruise, sailing on a traditional schooner out of Rockland, Maine. I had little idea what to expect; I only knew I was anxious to spend a few days “at sea” on a totally different kind of journey. When my friend Nicki offered to bring me with her on a “Lobsters and Lighthouses” cruise, I agreed immediately. 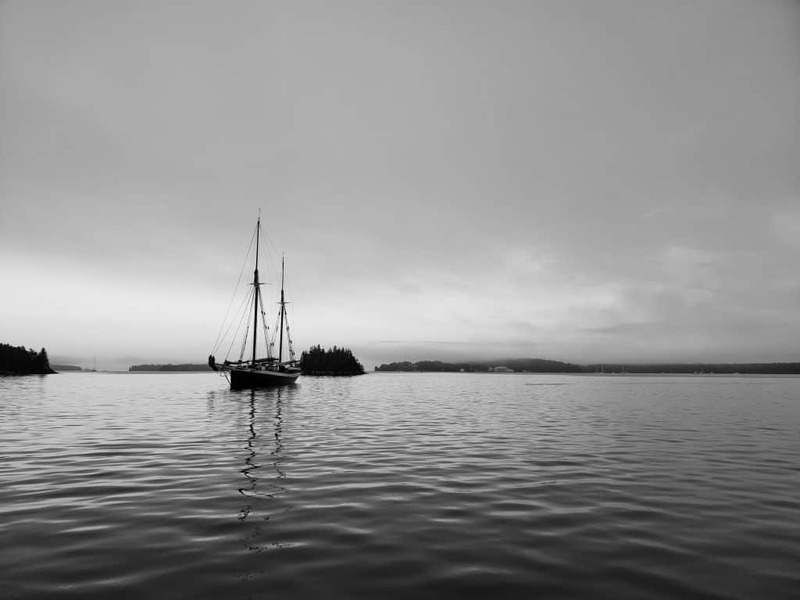 Would I like to go sailing on an authentic schooner off the coast of Maine? Absolutely. 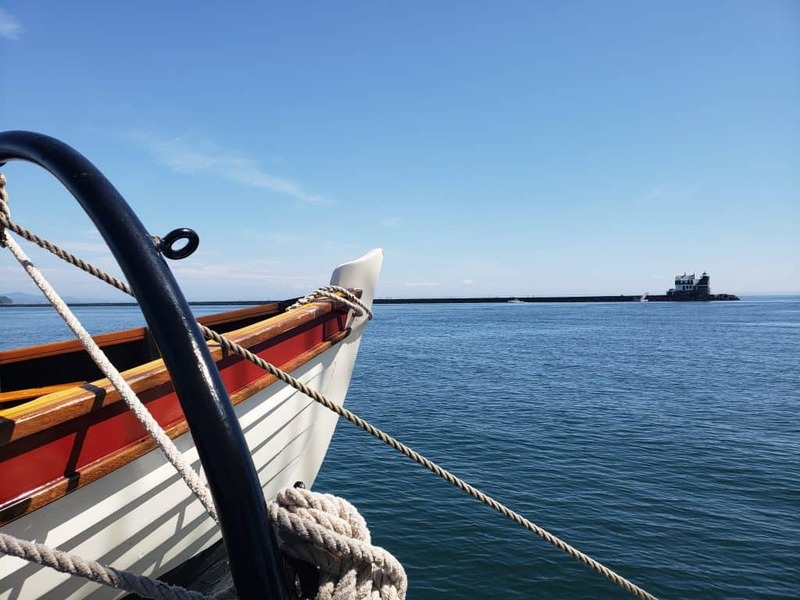 We sailed on the J&E Riggin, a 3-masted schooner built in 1927. The excitement begins even as you board the boat, because it’s unlike anything you’ve traveled on before. 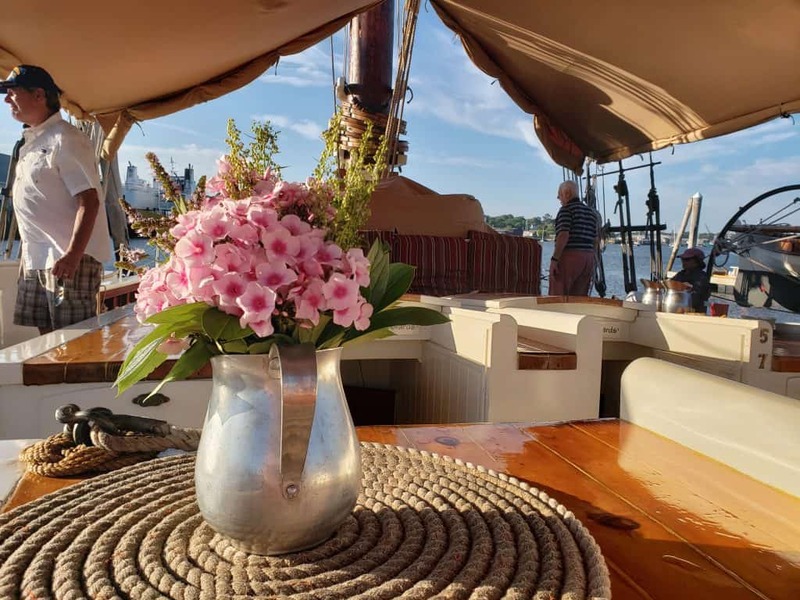 You immediately get a sense of luxury-meets-antique; while the boat is nearly a century old and boasts many original features, it’s sparkling and modernized in all the right ways. The decks, especially where passengers gather, are made of a gleaming, vibrant wood. 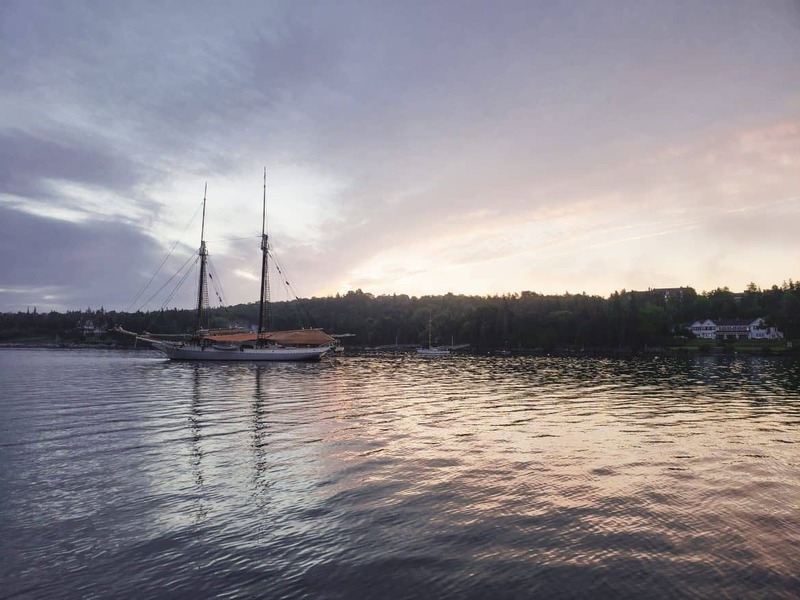 The boat itself is dressed in red and blue—a truly classic Maine sailing vessel. And there are plenty of comforts of home, including insanely delicious meals. On the first night, we stowed our luggage in our cabins below decks and met the captain and crew. We were briefed on our daily schedule and learned what our week aboard the Riggin would look like. We also learned a few essentials, including how to flush the toilets (very important!) That initial evening, I felt a little nervous. I didn’t know how I would feel during the trip. I’d never spent that many days on a boat. Would I be seasick? What if I didn’t like the other passengers? Would my cabin feel claustrophobic? I’ll admit, the unknown can be daunting, and I’m a person who gets a little anxious. As it turns out, my fears were unfounded and my nerves quickly calmed. By trip’s end, I could say without a doubt that the experience was fabulous, and above all, it was something really special and memorable. But I can also surmise that every cruise is likely to be vastly different. No two journeys are the same, and that’s part of what makes this so amazing. 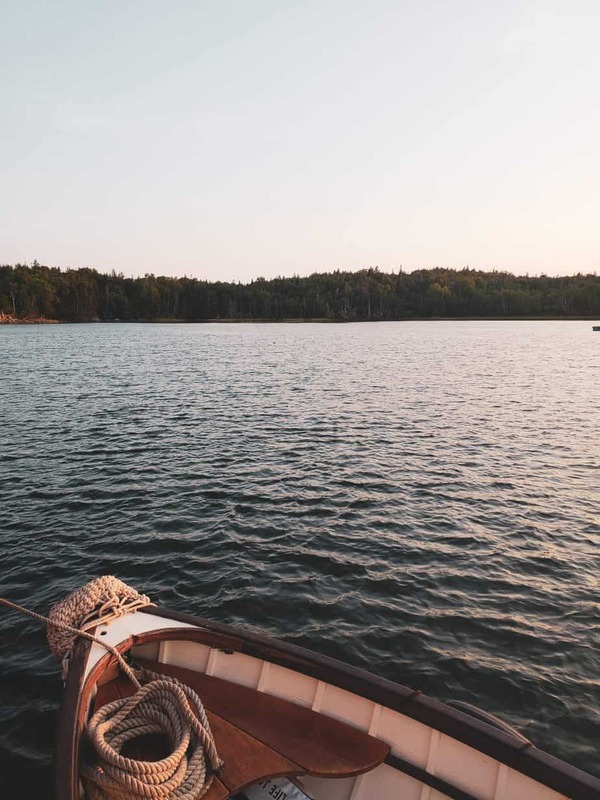 So, while your experience will doubtless be its own magical time, if you’re thinking of going on a sailing cruise in Maine, I’d love to tell you just a bit of what you can expect on this adventure. 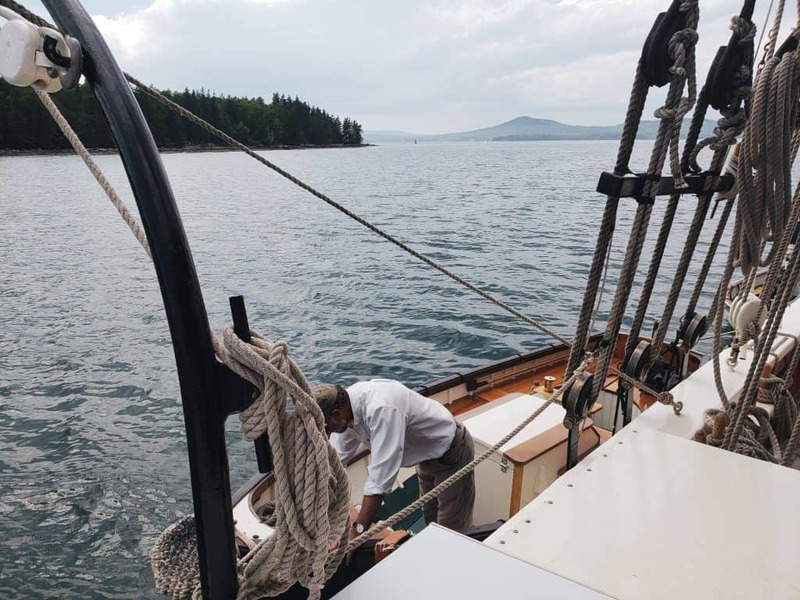 First of all, if you’re going on a schooner cruise in Maine, you probably already know that the Maine coast has some of the most spectacular scenery. With that, you will not be disappointed. 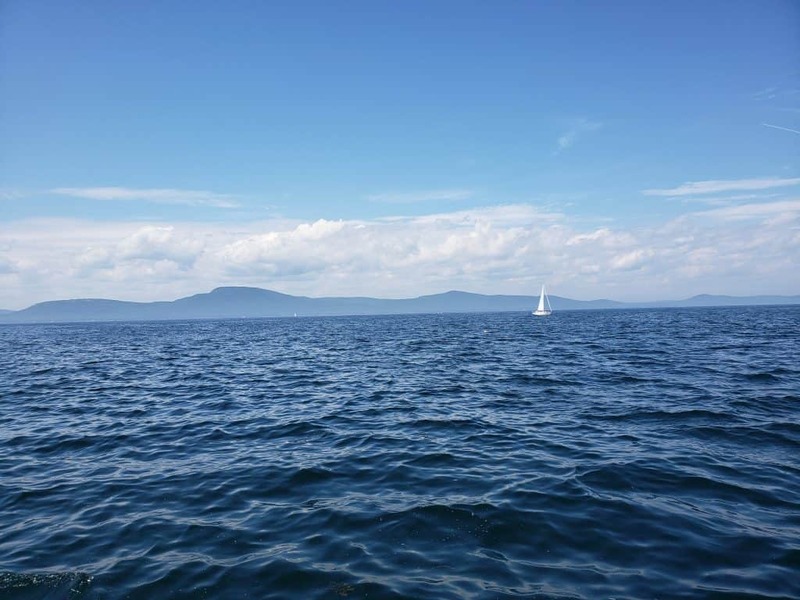 The Penobscot Bay, where the J&E Riggin sails, is breathtaking. During the trip we were constantly passing islands of all sizes and descriptions. Rocky coasts, pine-covered hills, and even treeless islands where the seabirds gather. 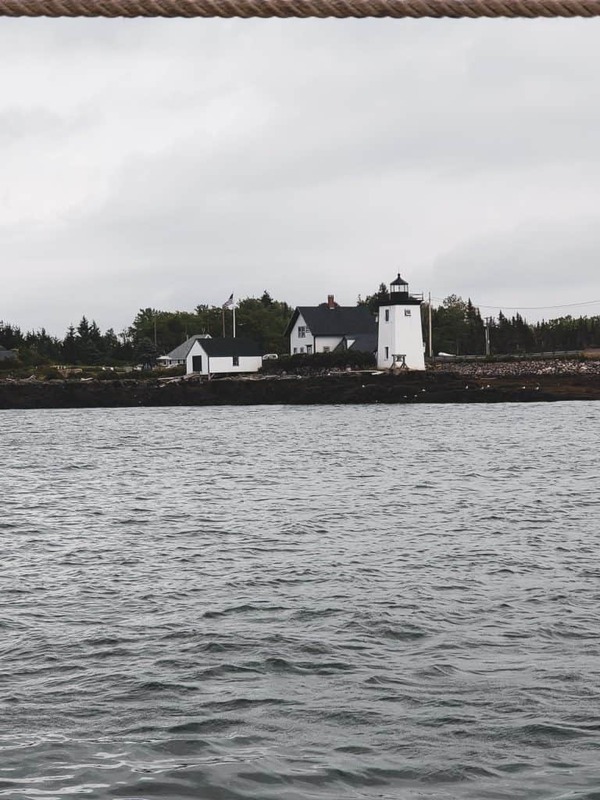 Our cruise took us past a half dozen or more lighthouses, which is definitely a highlight of traveling in Maine. Each lighthouse is unique in size and shape, but they all are beloved. It seems that everyone warms to a lighthouse. I suppose we all associate these beacons as symbols of light, hope, and home. All good things. 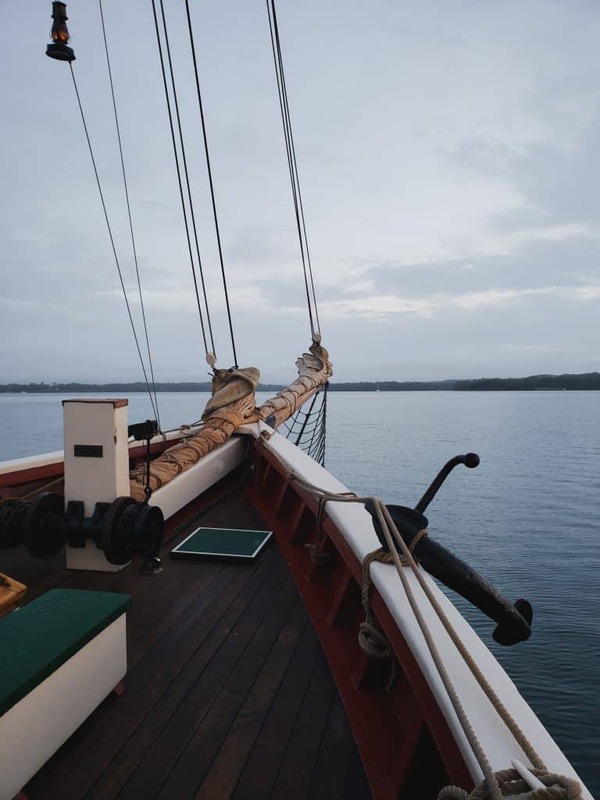 As you sail on your schooner, you’ll spend a lot of time gazing out at the blue waters of the Atlantic Ocean. Luckily, it’s incredibly beautiful. The meeting of the sea and sky, interrupted only by the gentle waves and the occasional porpoise or seal surfacing, is a hypnotic and peaceful sight. Bring your camera on this trip. 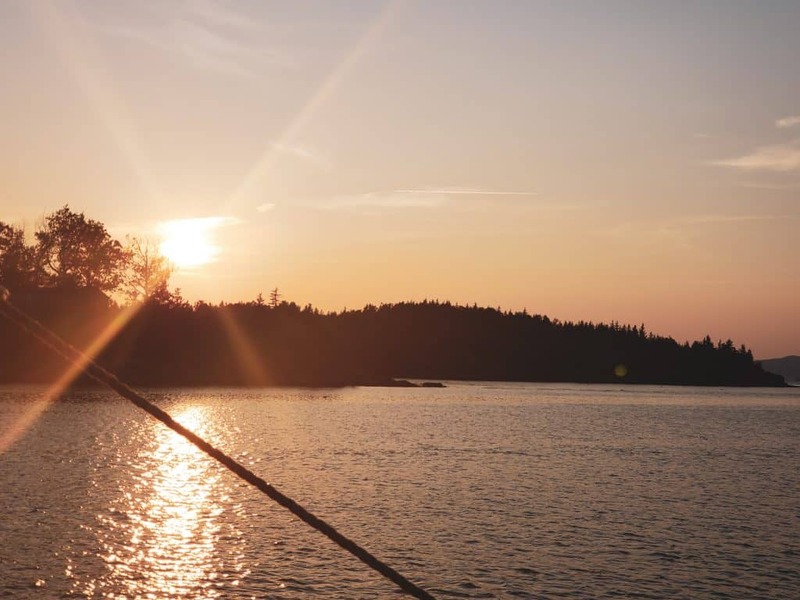 There will be so many opportunities to snap photos of the epic Maine coastline. I have mentioned that I was slightly nervous my first night aboard the boat. My primary misgiving was the cabin. They are admittedly….a bit snug. I was sharing with Nicki and I took the top bunk. Our beds were wedged into the wall, and though we had plenty of storage space for our things, my initial reaction was that I was not looking forward to sleeping there. But my worries quickly evaporated. It’s amazing how quickly a person can adjust to a new environment and a new routine. The cabins were ultimately extremely cozy. With a comfortable bed, a warm light to keep you company while you read under the covers, and the sound of the sea outside your window, you sleep like a baby. And you don’t spend much time in your cabin anyway. Nearly all your time awake is spent up on deck relaxing, chatting, dining, and sailing. 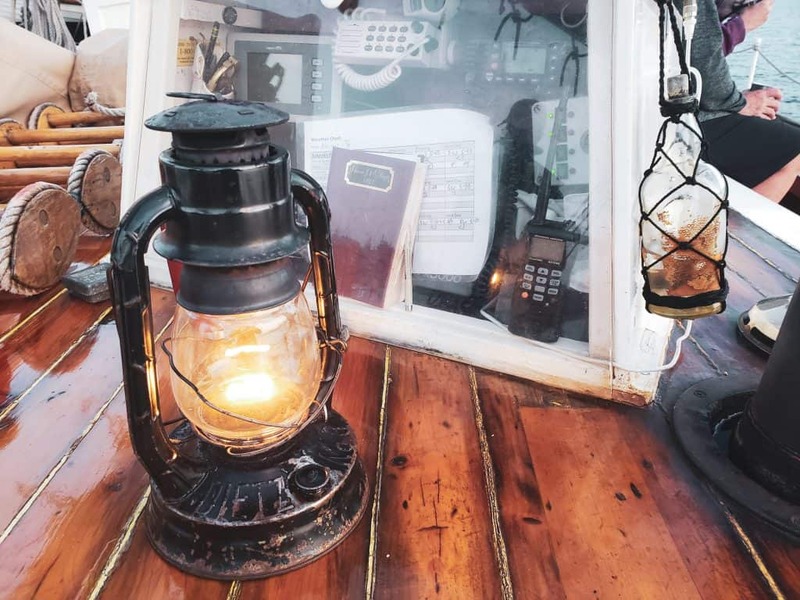 Aside from the accommodations, there are a few other unique features of schooner life to adapt to. But again, you adjust so quickly. The bathrooms on the ship are known as “heads” and they require a system of pumping to flush them. This must be done every time you use the head. Don’t worry. It soon becomes second nature. (Now that I’m home, I find a self-flushing toilet to be a thing of WONDER). You’ll also have to share a single shower with all other passengers aboard. But again, this is no problem. When you want to rinse off, the crew can turn on the hot water and you can enjoy a pleasant shower in one of the heads. Most passengers are happy to shower just once while onboard (which is what I did). The remainder of the time, let the sea be your natural cleanser! Hop in for a refreshing swim in the saltwater. You can also pack some essentials like dry shampoo and baby wipes—more on that later. While I still think sailing seems incredibly complicated, this trip taught me that—if you work as a team—anyone can help sail a vessel! Each day, when the crew of the Riggin raised the sails or heaved the anchor, they asked for volunteers. I never volunteered for the anchor raising…grown men seemed to quiver in their boots after that arduous task. But I did help out with raising the mainsail a few times. Together, we all stood on the port and starboard sides of the deck and pulled the ropes hand-over-hand to lift those incredible, huge sails. It was rewarding work and it really makes you appreciate just how many “hands on deck” are necessary to help keep a boat afloat. Because sailing relies so much on the wind, each day dawns with a somewhat unexpected itinerary. 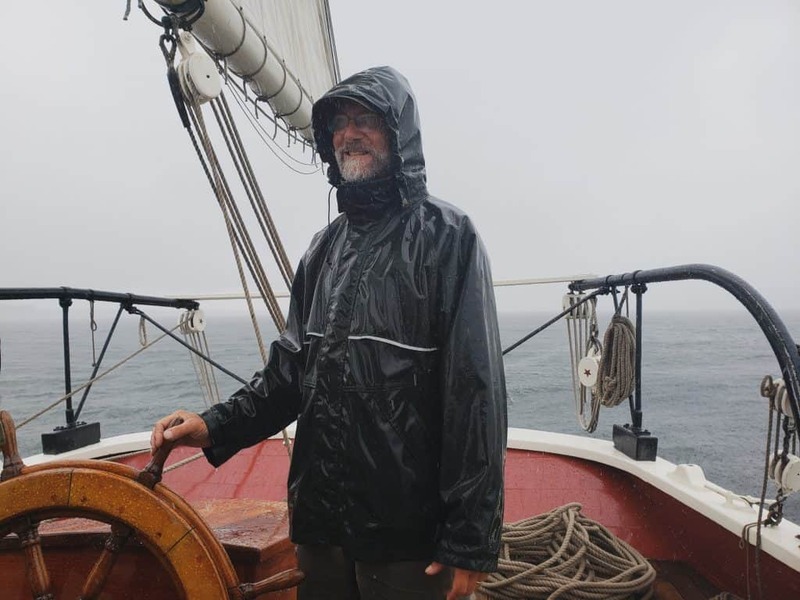 Though Captain Jon has a plan in mind, the Riggin often ends up “where the wind takes it.” This is one of the most enjoyable aspects of the windjammer cruise. Every day will include some sailing as you make your way to your next stop. Nearly every day gives you a chance to walk ashore, too. 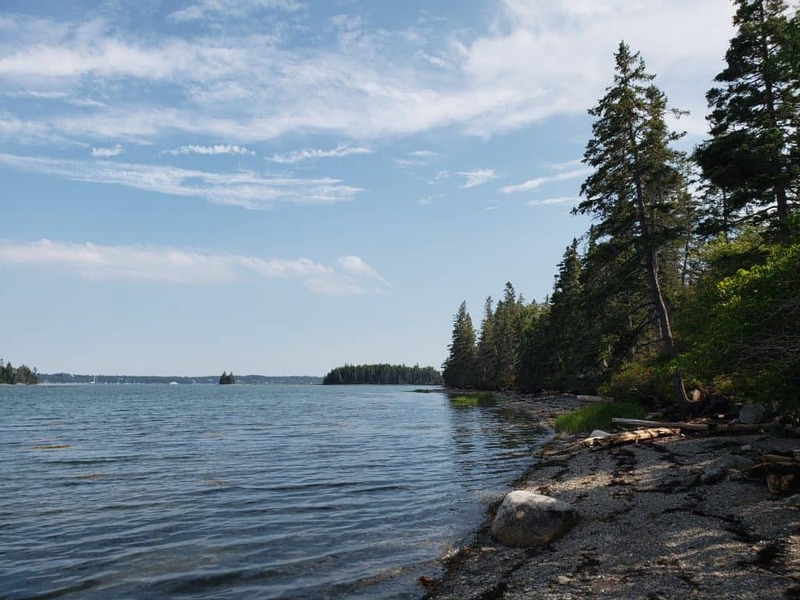 On our cruise we stopped at Warren Island State Park, where we had our traditional lobster bake, as well as the town of Castine, which we were able to explore for a few hours. 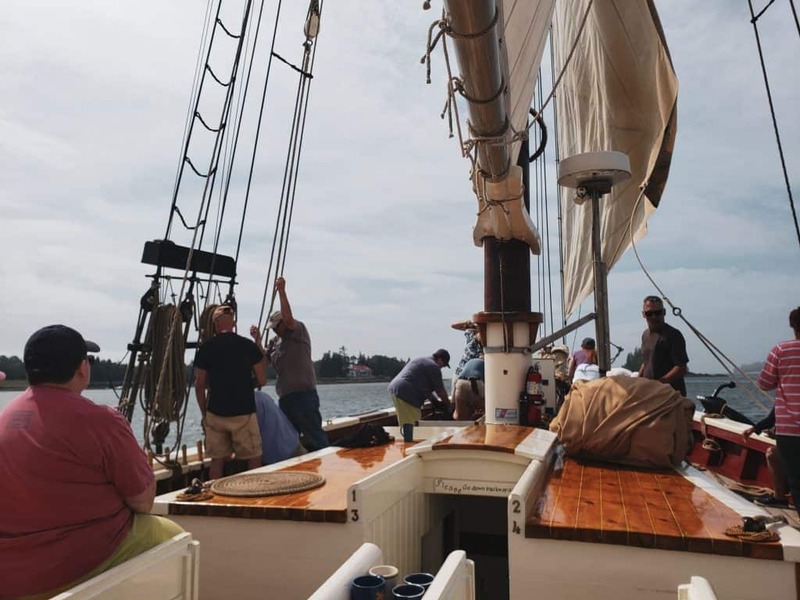 You can expect to see a lot of the Maine coast and the Penobscot Bay on a schooner trip on the J&E Riggin. Wake up each day ready and hoping for an adventure and I’m pretty sure you’ll get your wish. The weather can be unexpected, too. But even rainy days can turn into beautiful nights, and in any situation, the crew works hard to keep you comfortable. Honestly, having a bit of a storm at sea can be kind of fun. Oh, wildlife. How I love ye! Maine is a great place to spot some of God’s most amazing creatures (moose, to name just one), and the coast is no different. We saw porpoises, eagles, osprey, and my personal favorite, seals. Wildlife can appear at any time, and it’s usually when you least expect it. I found that just looking out at the water was the best method. Seals and porpoises are constantly popping up, sometimes fairly close to the boat. If you stay patient and keep your eyes open, you’ll almost certainly be rewarded with some Maine wildlife sightings. 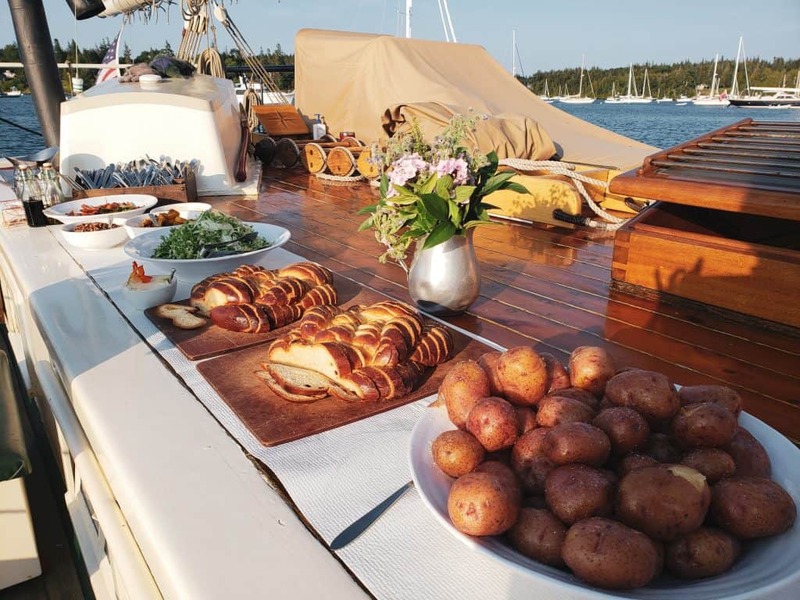 Before departing on our Maine windjammer cruise, we heard multiple times how fantastic the food was going to be. Those were words of truth! My goodness, we ate like royalty on the J&E Riggin. Every breakfast, lunch, and dinner was out of this world. We had pastries for breakfast, homemade pancakes with a choice of three flavorful syrups (Maine blueberry available of course) and a hearty vanilla oatmeal one morning. There was fresh coffee every day. Home baked bread. Dinners ranged from Asian inspired rice bowls to hearty beef rubbed with herbs de Provence. 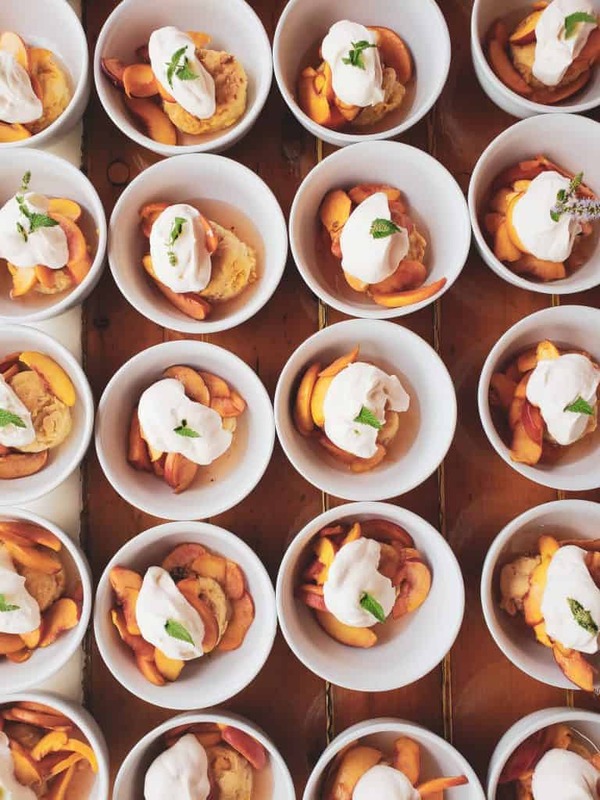 Incredible deserts every evening, including peach cobbler, creme brulee, and a chocolate tart. 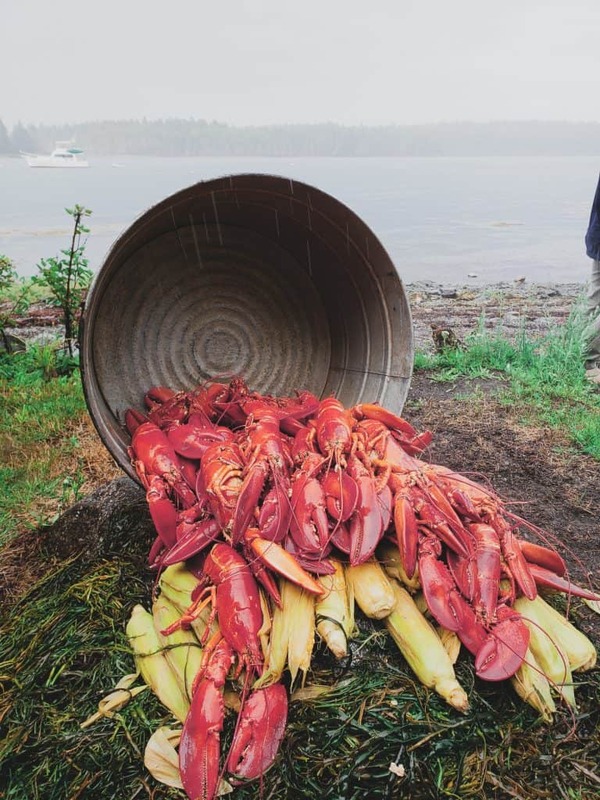 One of the highlights is the traditional lobster bake. The whole group heads ashore to cook up some fresh-as-can-be Maine lobster. The result is both delicious and visually beautiful! 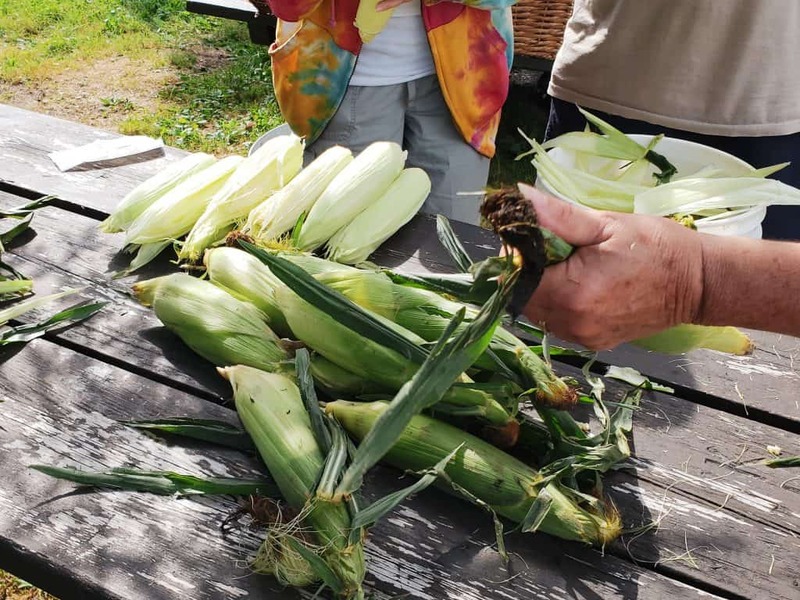 Along with corn on the cob, paella, fresh fruit, and s’mores for dessert, it’s the perfect summer meal. The cruise is BYOB, so bring along your favorite beverages to enjoy while onboard. There’s lots of great Maine beers, ciders, and wines you could choose from if you want something local. I think one of the most special things about a schooner cruise is the people you meet. There were passengers from all over the US, and it was a joy to chat with each of them. I also really enjoyed interacting with the crew, and most of all with Captains Jon & Annie. These two are the owners of the vessel and the creators of the wonderful schooner experience aboard the Riggin. Jon is the ship’s captain while his wife Annie prepares the gourmet meals down in the galley. 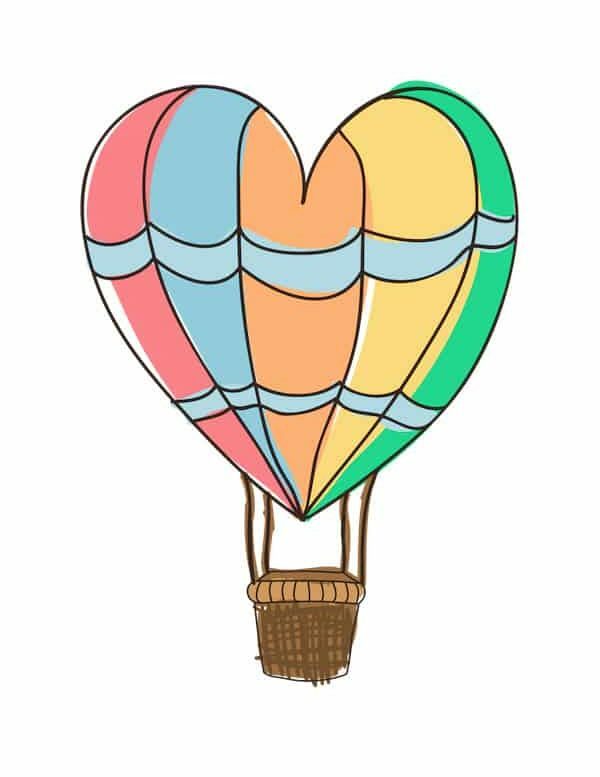 They are both aided by a crew of young, energetic people who were such fun and kind souls. The J&E Riggin truly is a family affair. On the last night, Annie, Jon, and their daughter Ella, who was a crew member, entertained us with music and singing. 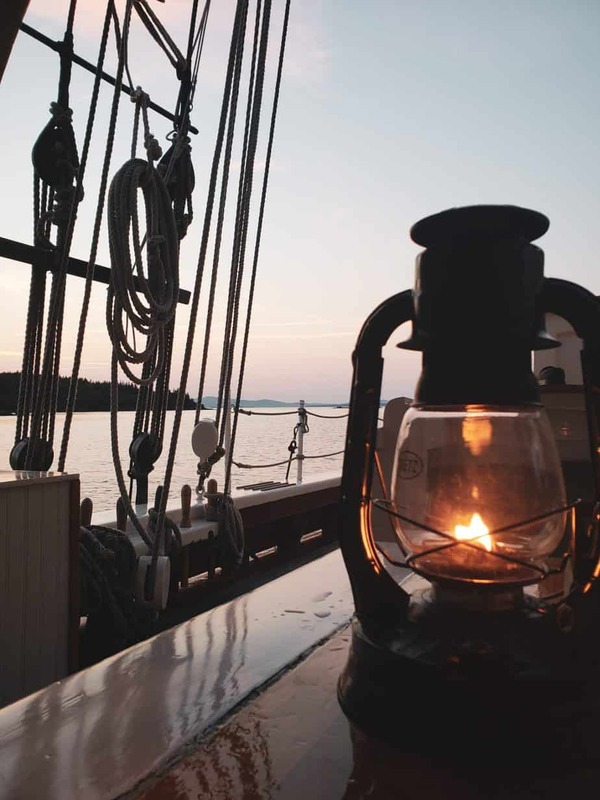 As we swayed in the falling darkness, the light of the lanterns gently illuminating our faces, we listened to the clear sounds of their voices bringing us traditional seafaring tunes. It was beautiful and sort of haunting, but I could see that every passenger relished the moment. I can honestly say that this is one talented family, between sailing, building, cooking, music, writing, and even art. It’s really special to get to know Annie, Jon, and the rest during those few days aboard the schooner. You can’t help but bond with one another through the experience. Portable charger (you probably won’t use a phone much on the trip, but if you’re taking a lot of photos, bring a battery backup. This will come in handy on other trips, too). It’s also wise to bring sunscreen and other toiletry items, but the boat also has plenty of these on board, so if you forget about an item, don’t worry. Great detailed explanation of what to expect on a Windjammer Cruise. While it is an amazing, unplugged experience, it might not be for those who are expecting 5 star luxury (except the food!). thanks so much, Dana! It really was so fabulous!